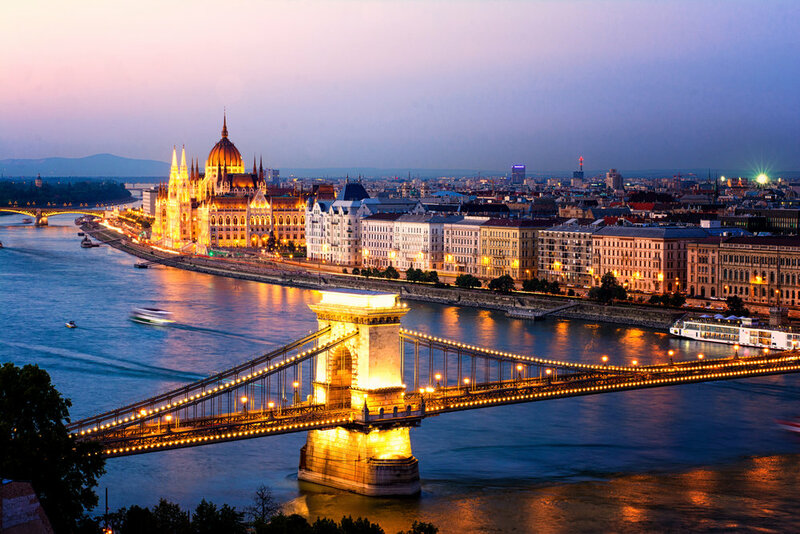 Budapest was originally two separate towns, appropriately called Buda and Pest, which are divided by the Danube River. These neighborhoods each have their own personality and iconic sights to see. Buda: West side of the river, more residential, hilly and green, where the castles are located. Pest: East side of the river, more lively nightlife with endless restaurants and cafes. We’ve compiled a list of sights you can not miss and things you must do during your time in Budapest. For one of the most beautiful views of the city take a walk up Liberty Hill. At the top, treat yourself to a cold drink, you will definitely be needing it! There are also plenty of Hungarian snacks to try up there whilst you wait for the sun to go down. There is a perfect view of both Buda and Pest with the bridges crossing the Danube and watching the colour of the sky change as the sunsets is just breath-taking. A MUST do! When it’s dark, walk along the Danube until you are opposite the Hungarian Parliament Building. The building lit up makes it look even more impressive than it already does. The overall size and design of the building is just incredible, and seeing the whole building from a distance helps you appreciate this. Don’t forget to check out the Parliament Building during the day too! A Hungarian speciality not to be missed. A deep-fried dough topped most commonly with sour cream and grated cheese, although there are plenty alternative toppings available. These are available all around the city, the challenge is to find the cheapest deal! If this doesn’t take your fancy, get your hands on a Chimney Cake, or some Paprika Chicken. They will not disappoint. The buildings in Budapest are very grand and this is no exception. Across the water is the Hungarian Parliament Building, so if the Bastion itself isn’t beautiful enough, its view will be sure to blow you away. But be sure to be there earlier as it quickly fills with people wanting that perfect Instagram photo! Running since 1870, the cable car is the least tiring way up to the castle. As you travel up, you will have a stunning view over the Chain Bridge to Pest. Once you are at the top, there are plenty of perfect photo spots! Don’t just stop at the Castle, head on the path ‘Tóth Árpád stny.’ towards Hospital in the Rock for a peaceful walk. Look up, there are hundreds of conkers in the trees! If Budapest hasn’t already amazed you with its buildings, this castle might just win you over. Not only is the castle itself elegant, but the pond in front of it and the moat around it add to the fairy-tale feel of the Castle. In the summer months you can rent a boat and ride around the pond right next to the Castle, whilst in the winter months the pond becomes Europe’s largest open-air ice rink! Ice skating in front of the castle would really be a fairy-tale finish. For the full Hungarian experience, relaxing in the thermal baths is a must! There are so many to choose from in Budapest from the oldest baths - Kiraly Bath and Rudas Bath - to the largest and most popular - Szechenyi Bath, each having something unique. If you like to party definitely head to Szcechenyi Bath for their special Bath Parties! You will find everything in this market; flowers, clothes, bags, souvenirs, food… everything! Upstairs there are plenty of places that you can sit down to some local cuisine which doesn’t just look amazing, it tastes it too. It’s a perfect place to stop off to grab a bite to eat, or a visit to Aldi, before crossing the Liberty Bridge, or walking along the Danube. Although this is not as spectacular as many of the sights in Budapest, it is something with so much meaning and history that you cannot miss it. Towards the end of WW2, thousands of Jews were executed along the banks, and these shoes are a memorial to them. Seeing all the different types of shoes, and the tiny shoes of children is very hard hitting, but somewhere I recommend everyone to go and experience. Sitting at the base of the column is the perfect place for a rest, before continuing to explore the surrounding area, especially if you like to people watch! So many people come and go, take pictures of the statues, get photos with the statues, and then suddenly an empty spot for you to get your photos. If you want those empty shots go early! But don’t forget to visit the statue at night to see it beautifully lit up.